On the morning of March 9, 29-year-old Samir H. was in a large pickup truck in southern Waziristan when a remote-controlled US Army drone, several kilometers high, took aim at the vehicle. Reports indicate that at least one of the three rockets launched by the drone hit the target and destroyed the pickup truck carrying up to 12 suspected Taliban and foreign fighters. The strike was reported at the time by the Pakistani news site Dawn.com, but the Der Speigel article is the first to make public that a German citizen was among the dead. But the European journalists had an entirely different reaction. They jumped to the attack, demanding to know how the European Union could condone what was essentially an execution without trial. Didn’t this wanton act, they asked, betray the EU’s commitment to the rule of law and equal justice for all? None of the EU countries has capital punishment. They frankly see that as a measure of their civilized values, and view the American fondness for the death penalty as barbaric. Given that, many Europeans are deeply uncomfortable with the US drone program. They often have a hard time distinguishing a targeted drone strike from an extra-judicial killing. And while getting rid of people who are fighting a holy war against everything Europe stands for isn’t exactly unpopular, the coldblooded way the Americans are going about it – and the near-total lack of oversight or accountability – makes them nervous. The Long War Journal blog picked up on the story as well, and provides some background on other German jihadis in Pakistan. But in the five days since a major European news outlet broke the news that a German citizen was recently blasted into oblivion from the skies, no one’s had much to say about it. Nathalie Van Raemdonck with the Instituto Affari Internazionali think tank in Rome notes the muted European response in the face of previous killings of European citizens by US drones. And she contrasts that with the outspoken way the European Commission and the European Council have reacted to targeted killings by, say, Israeli forces in the Palestinian territories. Does the EU’s silence thus flow from its vested interests, or is it a consequence of its lack of vigour and decisiveness? From the above, we can tell that one realistic interpretation is that EU member states have deliberately decided not to talk about targeted killings in Pakistan because of their multiple interests in condoning the tactic. I’m pretty conflicted on how I feel about this myself … Let’s face it, these are not nice people. And given the chance, they’re happy to blow up trains and machine-gun railway stations and fly airliners into buildings, and feel they’re doing God’s will. So it’s hard to work up a lot of sympathy for these guys. And the drone program has been notably successful in taking out al Qaeda leaders and making it harder for militant jihadis to operate. We now live in a society that embraces crossing people off a list via robot. Drones may be the least-awful, most-efficient, at times dazzlingly sophisticated way to run a war. But whatever your thoughts on the ethics of what may or may not be drone assassination, we’re, on the record, living in a new period of how we kill. And we need to spend time thinking about it. Does the fact that unmanned drones are an effective, low-risk way of killing bloodthirsty religious fanatics who want to slaughter us justify the increasingly creepy, Big Brother aspects of this program? Are we really OK with an opaque and unaccountable government system that allows people – even American citizens – to be killed on the president’s say-so, without any legal process whatsoever? I gotta say, for me, I’m glad it’s working. “…since a major European news outlet broke the news that a German citizen was recently blasted into oblivion from the skies, no one’s had much to say about it.” Is it not probable that Samir H. is either an immigrant or at the least not ethnicly germanic? I am not accusing Europe of being racist but it seems that the fact he was technically a German citizen weighs less on the scales of outrage than the fact that he was of middle eastern descent AND deliberately chose to participate in an un-“holy war” against European/American values, thus putting himself in harm’s way? I mean, when you ride around in the back of a pickup with a bunch of jihadis, you gotta know you are asking for trouble! What is more troubling to me than the fact it was a drone, which is NOT some autonomous killing machine, it does have human operators who decide to shoot the rockets, is the ambiguous quality of the information upon which those operators are making life and death decisions. Maybe that was a pickup load of guys going to work in the morning, it’s pretty hard to identify who is a jihadist and who is not just by the way they dress! When you are a soldier being shot at it’s a pretty good assumption that the guy shooting at you is the enemy and if you shoot back or launch a rocket at him, you are not going to kill some guy going to the market to sell his apricots. With a drone though, we have to trust that the operators are making decisions based on good information. Hi Ken, you raise some good points. Very good post, Liam. Maybe it’s the Canadian in me…or maybe it’s the result of having watched the US government act as global policeman/bully for too many decades now…but either way, my answer to both your questions is a big, unqualified “NO”. Definitely not OK with me. There has to be a better way of solving these problems than state-sanctioned murder. Thanks, Laurie. I hear what you’re saying. But are you really that sure? I mean, I have to admit that I take a certain guilty satisfaction when these gun-toting fanatics, who — let’s not forget, are dedicated to killing as many of us as they can, in the name of their god — get nailed by these drones. I know people who lost loved ones in the twin towers. My brother — an NYPD cop — had to undergo counseling to deal with his experiences after 9/11. I take the jihadis at their word when they say they intend to destroy us. And while I acknowledge the history and the American policies that have contributed to the anger in the Islamic world, I also see that we in the west are not to blame for all of their problems. And for all our faults, I genuinely believe that our values in the west really are the best hope for democracy and justice and peace in the world. When, for example, artists who draw insulting cartoons of Mohammed are targeted for death, it displays clearly the difference between a culture where different perspectives are fiercely debated over, and a culture where those differences are seen as sacrilege, and offenders are righteously killed. I’m queasy about the powers being taken by the executive branch in the never-ending “War on Terror.” And I’m disappointed that Obama has failed to make good on his election promises to close Gitmo and change the tenor of this conflict. I respect those nations which have chosen to abolish the death penalty. As an editorial writer, I supported an end to capitol punishment not for moral reasons — there is nothing in the Judeo-Christian ethic banning killing with moral justification — but because the criminal justice system was not fair and unbiased. As a result, people were sentenced to death who were a) innocent or b) had an unrelated factor, such as race. 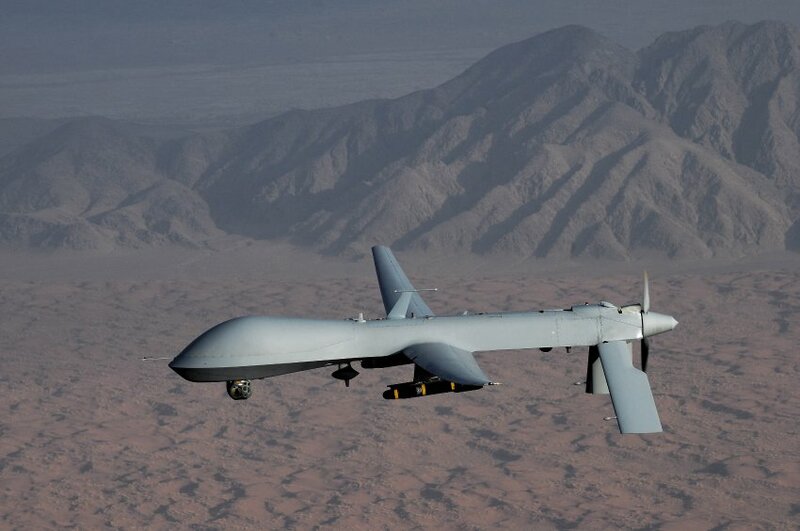 Which brings us to killing by remote device: the Drone Wars. Wars, by definition, are state sanctioned exercises in mass murder. Those who start them follow a pattern: kill as many as possible in a first strike to demoralize the enemy and then consolidate that victory and move forward. They never envision losing, or the ramifications of a retaliation by a country which does not knuckle under. Germany and Japan learned that lesson the hard way in WW2. I’ll not reopen the argument about the wisdom of dropping an atomic bomb on Japan. But the point is when you start a war, you are not in a position to dictate the terms of retaliation. While Ms. MacBride is correct in stating/wishing that “there has to be a better way.” The fact is that there isn’t. People who seek to kill and maim and revel in killing and maiming are not dissuaded by verbiage of any kind. Advancing to the 21st Century, people who cheerfully cut off the noses and breasts of young women and girls for the crime of trying to learn to read are immune from any argument Ms. MacBride could ever muster. So what to do to stop people like that from hiding out in remote areas of the world and launching murder attacks? Pacifism, as Dr. Martin Luther King, Jr. wrote, is non confrontational and “acquiescence to evil is evil.” Non violent confrontation, a step up from pacifism, only works as a tactic when both sides share the same moral framework. That is why it worked in Birmingham, Alabama, but could not work in apartheid Johannesburg. Since the Taliban — like the Nazis — believe that God sanctions the murder and maiming of everyone else, there is nothing moral to appeal to and, therefore, non-violence is not a viable option. 1. Carpet bomb the region as we did in Vietnam and simply kill everyone in the tribal regions. 2. Mobilize a force of about 200,000 troops and invade the tribal region of Pakistan. 3. Engage electronic and human espionage to locate elements of the command structure and take them out with drone strikes. Each option has collateral victims. The difference is in scale. Those are your real world options.